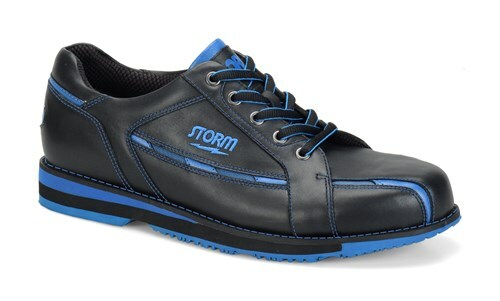 Storm has developed the SP2 800 Black/Blue Right Handed high performance shoe. This shoe features blucher upper pattern for custom fit, a rubber push off traction sole, and Storm's S8 sole and H5 saw tooth heel on the slide foot. 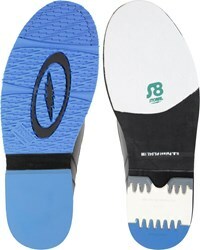 This shoe also comes with an extra slide and heel so you can create the best approach for your bowling style! If you are a serious toe dragger, I would look into toe caps for your shoes. Any shoe that has a toe cap is a good shoe for a toe dragger. Do you have a shoe for left hand bowler ? Hi Andrew! At this time, the SP 800 blue/black model will only be offered for right handed bowlers. I have Dexter shoes now. Will the storm sp800 fit the same? Yes, they should fit the same as Dexter shoes. I have a wide foot, do they come in wide width? Hello! Give us a call in our office regarding this problem and we will get that taken care of for you! 1-800-441-2695. Due to the time it takes to produce the Storm Mens SP 800 Black/Blue Right Hand ball it will ship in 2 bus. days. We cannot ship this ball outside the United States.